It’s a completely FREE entry competition and I gotta be honest with you, I nearly kept it for myself— sounds like the dream trip for me and the misses!! The Discovery Channel and Trivento wines are giving you the chance to win a 7-day trip for two to the prestigious wine region of Mendoza, located in the northern-central part of Argentina and the home of Malbec; one of my favourite red wines. For those who aren’t too familiar with wines, Malbec is a grape variety which probably originated in France but found it’s home in Argentina. 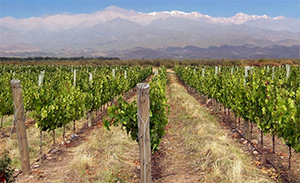 Today you can easily find bottles from France, Chili and California…but Mendoza is where you find the winners! a bike ride tour through the wineries – that’ll be fun; bring a helmet!!! £500 cash, travel insurance, 5* accommodation, flights, breakfast and a few lunches. The Discovery Channel are pretty flexible as to when you can take the holiday. Outside of the usual prime-time dates such as during school holidays, Christmas and Valentines. This is one of the few current TV competitions that is completely FREE to enter. Simply answer the question and submit your details online using the entry form.